Available now on Kindle for £14.99 special offer. The greatest threat to democracy is that its participants have lost the art of disagreeing well. We have come to the end of a political paradigm, an organising principle for society that served some in some societies for seventy years. The struggle between the evil twins of communism and fascism that perversely evoked daring, imagination and commitments, gave rise to a social democracy and then to a neo-liberal way of doing things. Both have now run their course. What organising principle is going to serve us now? With what shall we replace crumbling edifices? The abasement of democracy calls at least for rekindling liberalism – or does it? 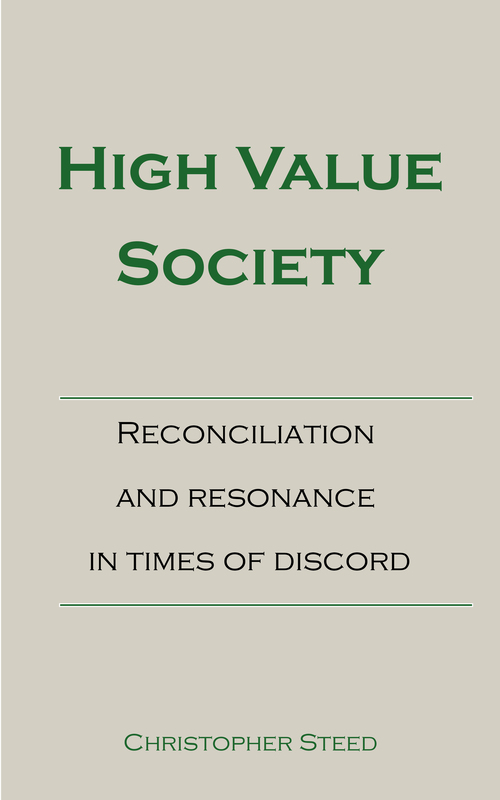 The response of this book will be called ‘high value society’; a new vocabulary for a common platform that challenges power. It calls at the same time for human flourishing within valuing environments plus the natural ecology of which symbiotically and unavoidably we are a part. To put society back together and grapple with the need to put us on a war footing to deal with the looming environmental emergency requires new thinking about the social ecology as an integrated unit. The natural world also is a valuing environment. It affects us and vica versa. As we will argue, society is experiencing a profound culture shift in our political ideas from wanting economic goods towards wanting respect. The quest for equal and inner dignity, the human desire for recognition and respect, has become hugely important, especially for those that had been marginalised. White voters who used to support the left of politics felt they had lost ground and pushed back as the former tribes of the dispossessed moved inexorably towards centres of power. The result has been toxic polarisation and entrenched division. Politics and its tribes used to be based on economics and the power to maintain people’s hold over resources. Now in landscapes that are re-shaped, it is more likely to be based on culture and identity. Alternative visions are needed that accommodates contemporary demands for one’s inner self to be honoured. How the present times makes sense of social experience is the subject both of passionate claims and competing visions of what ought to be. Divided imagination of the political future is an increasingly turbulent storm centre. Politics is largely about alternative visions people wish to construct. As a result, we are in serious trouble. It is time for a political philosophy that can respond to an age of democratic decay. We will explore in these pages a strong need for a politics of resonance through which new networks of reconciliation, dialogue, communication and hope can emerge. This is surely the antidote to the extremism, to the retreat from liberalism and an open society we are seeing on every side. 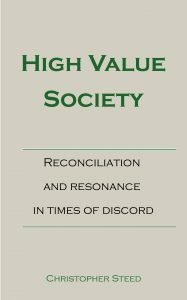 Our proposal for a high value society seeks to map out such a politics, rooted in a new account of the relationship between the individual, the market and society. The time is ripe for a new account of the political and communal order that can incubate new ideas, new ways of doing things. The lens through which we will examine the key idea of solidarity based on ‘a community of valuers’, is that the value society places on people is fundamental to their flourishing. This completely goes against the mood of ‘Me first’ that has steadily encroached on our sense of civic responsibility. It runs counter to a more extreme view – possibly related – that individual humans are only of value if they fit in, keep up and look good.